I don't need it every single day, I can function without it, and a very small portion of my disposable income is set aside for it. This is a good thing, since I'm somewhat of a snob when it comes to black gold. And I'm not talking about oil. You may know this delicious drug as coffee, but to me, it's heaven in a cup. And when I do crave it, I will go out of my way — and spend a significant amount of money — to ensure that no inferior brew washes over my taste buds. See, like I said — coffee snob. And I make no apologies for this. But I must admit, in the coming years, my snobbery is going to cost me a small fortune. Last Thursday, futures prices for Arabica coffee fell to their lowest in almost five months. Plenty of investors that were betting on higher prices folded as the shorts moved in. Prices are now down about 25% since peaking at more than $2.00 in April. Fears of drought facilitated that run. Of course, YTD, coffee prices remain up about 50%. 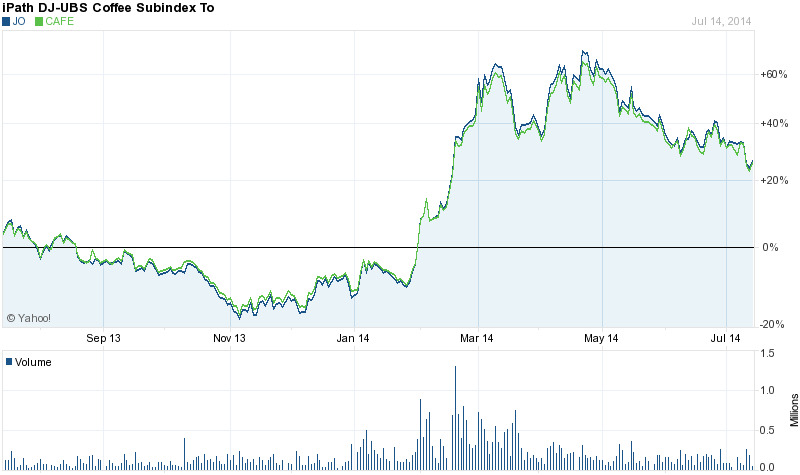 And despite this recent sell-off, I believe coffee prices are going to soar over the long term. You see, while you may not read about this at your local Starbucks, the global supply of coffee is under threat. This is not hyperbole, either. This is fact, despite the fact that few in the mainstream media are talking about it. There are actually three threats to the global supply of coffee, and all three seem to be converging at the same time. And while your morning cup of joe is going to become significantly more expensive, if you play your cards right and invest accordingly, your portfolio could also get a very nice boost. The first threat to the global supply of coffee is leaf rust, which is basically a plant-choking fungus. 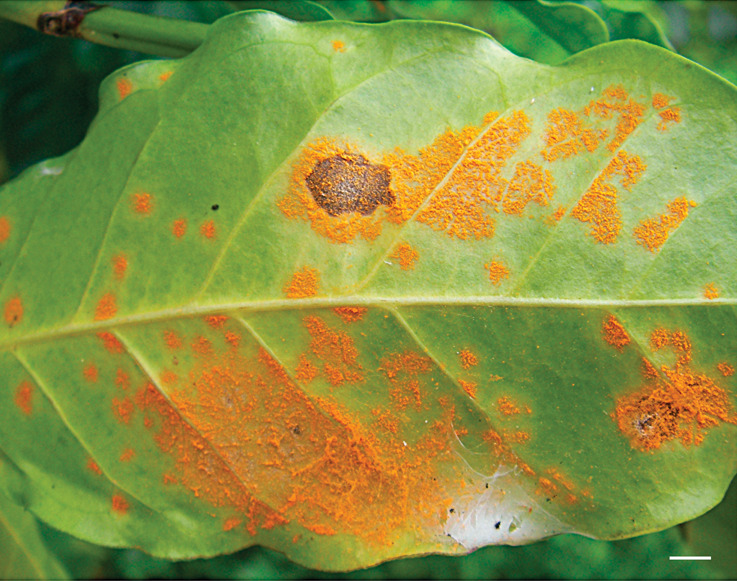 According to the International Coffee Organization, there is currently an epidemic of coffee leaf rust that's affecting every country in Central America with a 53% incidence. This is the worst it's been since 1976, and per U.S. government estimates, it has caused about $1 billion in economic damage in less than two years. The estimates are predicted to climb, too, as the fungus is expected to spread even further next year. Increases in global temperatures are cause for serious concern among coffee growers, and experts have already published their warnings. Dr. Tim Schilling of the World Coffee Research program at Texas A&M University noted that the rise in global temperature is of great concern for the coffee industry because it will — and has already started to — put the supply of quality coffee at great risk. This will have a very negative effect on production and, over the long term, will definitely cause prices to rise. At most risk is Brazil, which supplies roughly one-third of the world's coffee. Severe droughts have been predicted in the region, and coffee plants don't like dry weather. In fact, back in January and February, a drought resulted in the destruction of about 25% of the nation's crops. Fortunately, warehoused product from the prior year provided a necessary hedge. Warmer weather also carries with it the coffee berry borer beetle. It actually migrates with warming weather and, according to researchers at Yale, is the most costly pest affecting the coffee industry today, causing more than a half billion a year in damages. This doesn't bode well for an industry that's also growing rapidly. Although Asia is a continent full of tea-drinkers, there is no doubt that the sweet smell of black gold coupled with a growing middle class has been luring the masses to the bean. While global demand for coffee has been growing by an average of 2% annually, China, India, and Russia have been witnessing annual growth rates of up to 20% per year. 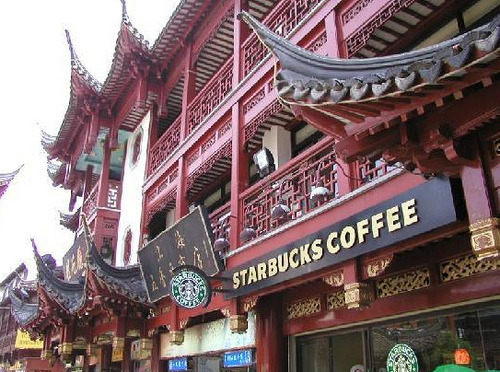 In fact, according to Starbucks, China will actually surpass Canada to become the second-largest coffee market — after the United States. No wonder the powerhouse coffee pusher now has more than 1,200 stores in nearly 70 cities throughout China. Of course, as demand continues to soar in Asia (the UK is also seeing a significant rise in coffee sales), global supplies remain at risk of being insufficient to meet that demand due to a potentially long-term cycle of extreme weather events and the continued propagation of fungi and pests. For coffee drinkers, this is no good. For investors, this is an opportunity. Despite the recent drop in coffee futures, two specific coffee ETNs have been performing quite well this year: the iPath Dow Jones UBS Coffee ETN (NYSE: JO) and the iPath Pure Beta Coffee ETN (NYSE: CAFE). I actually believe both of these are trading where they should be right now, although it goes without saying that playing coffee futures is not for the risk-averse. After all, coffee investments have a long history of volatility. But if you play it right, you can use that volatility to your advantage. Over the long term, I have no doubt that global coffee supplies will be constricted and prices will remain high. I'm not saying to run out and buy these ETNs immediately, but if you have the patience and you don't mind a little short-term risk, you could do well with either of these ETNs. And for you coffee lovers, check out this really fantastic Haitian Blue coffee I discovered last year put out by a roaster called Cafe Kreyol out of northern Virginia. Tasty stuff! And not too expensive, either. With renewable energy booming, this is a great time to own a renewable energy yieldco. Steady gains and steady yields... you can't beat it. Energy and Capital editor Keith Kohl takes a closer look at why Saudi oil princes are breaking out in a nervous sweat over the U.S. becoming the world's largest oil producer.